Soft serve ice cream cone vendors who want to cater to customers who crave both chocolate and vanilla can invest in a machine that combines both flavors into one twisty swirl. But what happens when a plethora of patrons start clamoring for just plain vanilla, the old machine for which is on the fritz? How does the ice cream man convince those consumers that they should insist on the twist instead? "It's important for publishers and content providers to be able to translate their brands into many different formats. It's the direction we're headed where consumers demand experiences native to their platform," says Jason Kint, CEO of Digital Content Next. He believes that print consumers are loyal to a brand "because they trust their content, and that loyalty will absolutely translate to digital." Michael Shapiro, CEO/publisher of TAPinto.net, a network of over 50 online local newspaper franchises in New Jersey and New York, says it's especially vital for publishers to cater to online readers "because, for younger generations, online is all they know, and they are the main consumers in our economy. If publications don't have robust online sites, they are sacrificing the future of their publications." That's not to say that print publications should necessarily take a back seat or be phased out, however. Consider that the majority of revenues for consumer publishers will derive from print over the next few years, with print expected to command nearly 75% of those revenues by 2020, down from 86% in 2015 but still comprising the lion's share of revenue over digital, according to Ovum's Digital Consumer Publishing Forecast released last year. 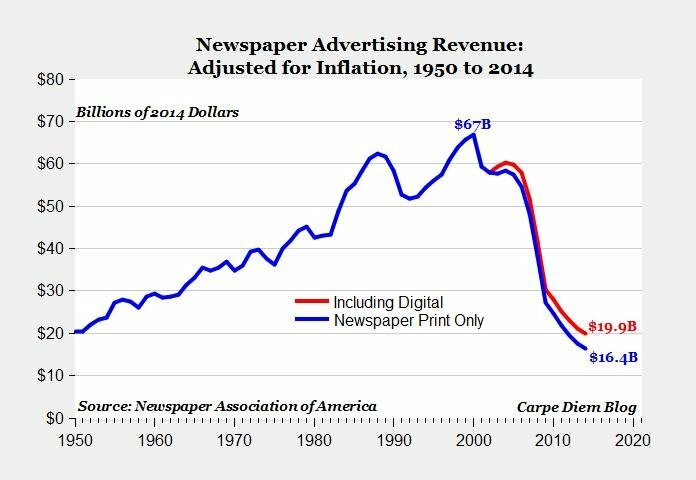 Newspaper Association of America data suggest that print editions remain a vital portion of a newspaper's business model: In 2014, the most recent year for which data is available, newspaper print advertising produced $16.4 billion in revenue-representing over three-fourths of all newspaper ad revenue. To further underscore why the print audience is important, consider the recent trend of digital properties launching (or reviving) print editions, including LuxeGetaways, Tablet, GOOD, Newsweek, and Pando. Damon M. Banks, editor-in-chief for LuxeGetaways Magazine, says his print version was created to reach a larger demographic of readers who still enjoy flipping through pages. "In today's market, it's really difficult to compete without approaching marketing, advertising and publishing across several platforms," says Banks. "Many readers will read a print magazine and then go to the website to read further. But there are also many who will only read either the print or digital editions. In both cases, it's important to maintain continuity across all platforms and, via print, digital or both, reach the largest amount of readers possible." Shapiro cautions, however, that converting a print user to digital and vice versa can be more difficult than publishers realize. "People are set in their ways. Digital provides so many advantages, but to those who have read (print) the same way for the last 20 or 30 years, that is what they are used to. If publishers attempt to convert print readers haphazardly or too quickly, they may lose the reader altogether, which would impact their circulation as well as their revenue." To encourage readers to consume both your print and digital editions and better ensure the survival of both, it's important to offer value and incentives to your readers. "Providing the standard content to both the print and digital editions is key, but don't forget to add some extra content, links, and more to keep it interesting in the digital world," Banks suggests. Additionally, reader attention span online is less than print, "so you need to capture the reader's attention early and keep articles short and meaningful online," says Shapiro.